A few weeks ago I shot some outfits with Richard for upcoming blogs. Little did I know, I would soon be wearing a cast--I fractured my hand last week. So this will be one of the last blogs for a while, without a cast incorporated into my look. I want my hand back--wahhhh!!!! 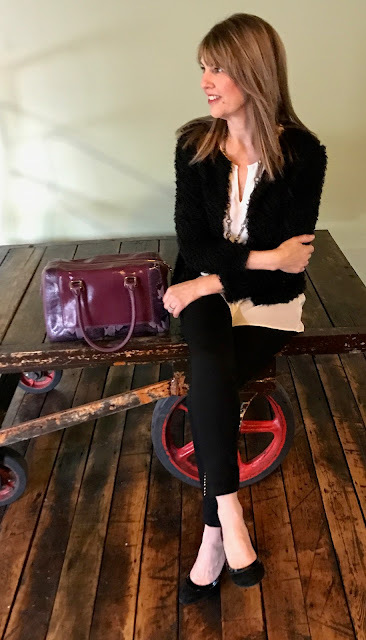 This outfit is super simple, yet so comfortable and chic, I paired a loose cream silky top (a wardrobe staple--similar HERE and HERE) with Joe's skinny high-rise black jeans, suede pumps (love the kitten heel and price!) and a very fuzzy jacket (similar HERE). This fabulous pendant is from Set in Stone Custom Jewelry. The owner and jewelry designer Dawn is just the sweetest. She donates gorgeous necklaces to Uncommon Threads which make our clients incredibly happy. I hope you will check out her website. I know you will love her jewelry as much as I do. 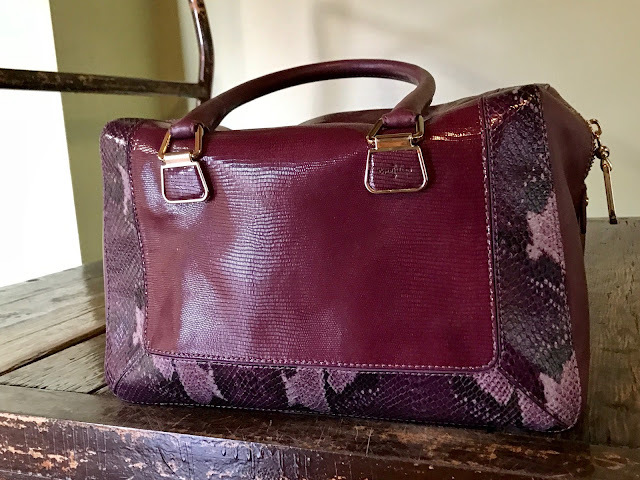 I picked up this fabulous Cole Haan bag (VERY SIMILAR HERE) at Chic Consignment last week during their huge clearance sale--nabbed it for just $20! Happy dance! The best part of their sale was that 50% of the proceeds went to Uncommon Threads and $800 was raised!! Here are other bags that also have snakeskin trim HERE HERE HERE and HERE (all under $100). The next several months will be a bit of a challenge. Getting dressed isn't easy with one hand (nor is doing my hair or putting on make-up!) and so many of my clothes won't fit over the cast. So bear with me as I transition my style to "broken hand attire". Stay tuned! By the way, I was featured in Woman's World Magazine this week! While you are at the supermarket or pharmacy, pick up your copy of the March 13th issue and check out page 8! 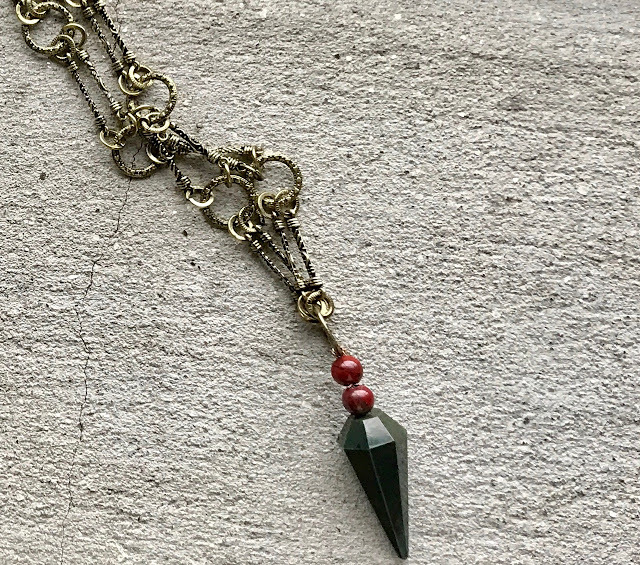 Some links in this blog may generate a small commission and the Set in Stone necklace was gifted. However, the content of my posts are based on my own honest opinions and are not in any way influenced by partnerships. 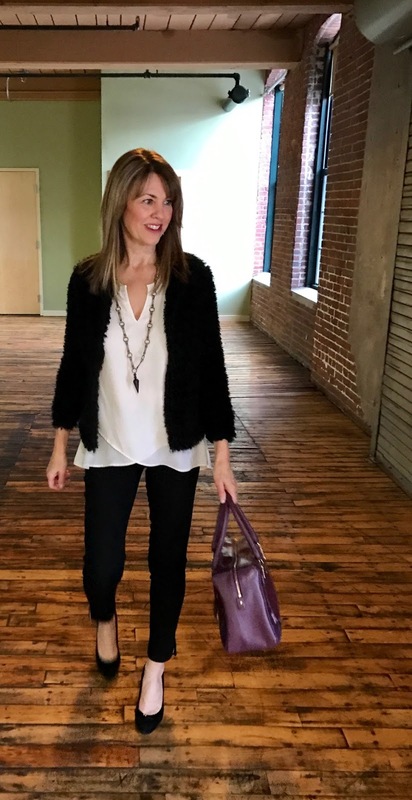 That fuzzy outfit is so cute Suzanne and that pretty wine bag stands out in this monochrome look! Love it!